Forex news for NY trading on June 15, 2018. WTI crude oil futures settled the week at $65.06. That was down $1.80 or -2.74%. The price is trading lower in post close trading at $64.73. US stocks are closing lower, but well off the lows. It’s Friday. It’s the “real” start of the World Cup (wait until the UK plays on Monday) and a day after A BIG move in the forex markets. Yes, Pres. Trump officially announced up to $50B of tariffs against China to start on July 6th. China immediately said that they would retaliate and later in the US afternoon session, they too announced up to $50B. Both the US and China said they would apply 25% tariffs on goods totaling $34M. If the US raises by the incremental $16B, China would also do an incremental $16B as well. Stocks opened lower on the tariff news and the Dow was down -280 points at the lows. However, as the day went on, the fears from the tariffs from having too much of an impact started to fade away. Plus the start date of July 6th – although just a few weeks away – is still some time for negotiations to take place (or for more serious discussion). Stocks started to rebound. Yields which were also lower – the 10 year moved down to 2.887% at one point – is closing at 2.92%. It is still down by -1.3 bps (and well off the over 3.00% levels seen after the Fed tightening on Wednesday), but it seemed like a bottom was in place. How about the forex market? Well, the EUR which was smacked lower yesterday, is ending the day as the strongest today. The CAD was the worst performer today on the back of trade concerns, some manufacturing sales that were much worse than expected, and oil which is ending the day down -3.77% (not good for the loonie). 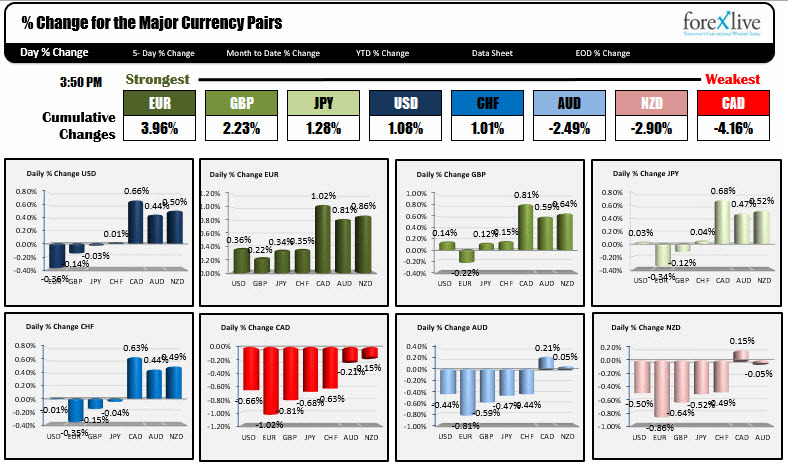 The USD was mixed with gains against the commodity pairs and modest declines vs the EUR, GBP and JPY. Honestly, the ranges in the NY session were very confined. For the week, it was one chock full of stuff. CPI inflation in UK and US. The big events ended up being the stronger than expected US retail sales (which has GDP estimates up to 3.8%-4% of so) and the ECB – which announced QE taper but not until September and contingent on data. Draghi also put a date of end of summer 2019 for the chance for a hike in rates (and didn’t sound too convincing it might happen). That news sent the dollar soaring. Next week, traders will be looking for more dollar buying but the calendar will be a little lighter. Draghi and Powell will both be speaking at a central bank forum in Portugal, however, and the BOE will meet and decide on rates/policy going forward. This week, Powell was solid at his meeting this week. Draghi, however, was wishy-washy about prospects and rightfully so. If he has a repeat performance next week, we could see the dollars march higher resume. Wishing all a happy, safe and peaceful weekend.